Outside of Asia, France is one of the world’s martial arts powerhouses. Both judo and karate are extremely popular across the country and French athletes regularly medal in international competitions. France is second only to Japan in karate medals since the World Championships were first organized in 1970! While not an Olympic sport, karate has a strong worldwide following–the World Karate Federation claims that there are over 100 million karateka worldwide! A karateka is someone who practices karate. France will host the 21st World Karate Championships this fall. (France previously hosted in 1972.) The first Championships were held in Tokyo and represent the highest level of competition for the sport. Since then, the best karateka have been meeting each other every two years and touring the world at the same time! Tokyo, Madrid, Tampere and Sydney have all hosted the championships. From 21-25 November 2012, athletes from over 100 countries will come together in Paris to test themselves and their peers. On 7 September 2012, La Poste issued a commemorative souvenir sheet featuring three stamps drawn in a manga style. All three stamps are 0.89€, the current price to send an envelope or postcard weighing up to 20g worldwide. 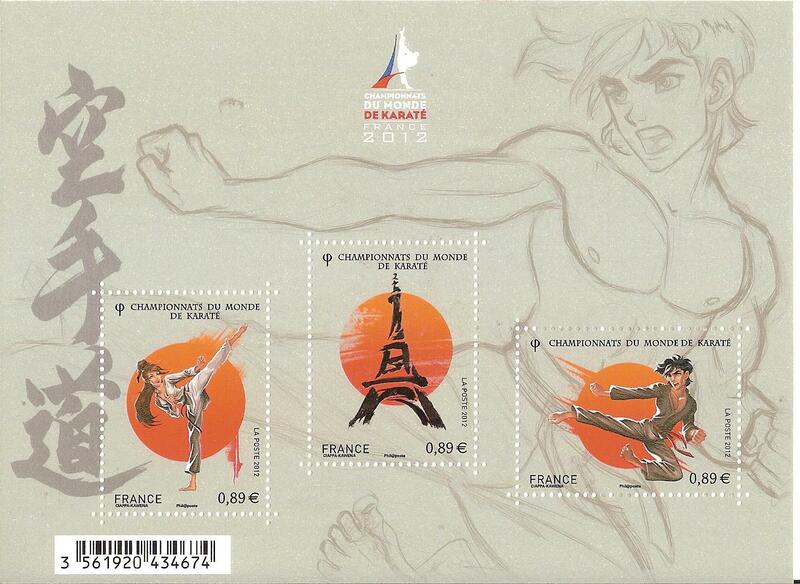 The first stamp features a teenage girl doing a Mawashi Geri, the second a stylized Eiffel Tower and the third a teenage boy in the middle of a Yoko Tobi Geri. For those looking to get a bit closer to the action than via a stamp, tickets are still available for the competition. While Saturday and Sunday’s events are sold out, you can still see karate’s best during the weekday events for only 14€/person! This entry was posted in Life in France, Stamps and tagged france karate stamp, karate stamp, World Karate Championships France 2012 Stamp Minisheet. Bookmark the permalink.